Linear & Rittal: Blazing a Trail through the Automation Industry | Rittal - The System. 2018-06-27. Linear Transfer Automation, Inc. has been the backbone of the metal-forming & stamping automation industry landscape for a long time, eliminating a lot of heavy lifting and repetitive tasks and adding increased productivity and flexibility to manual and aging processes in the metal-forming / stamping industry. Linear’s automation products range from high speed material feeding systems, through stamping processes with transfer systems and end-of line stacking systems. Linear’s goal is simply to be the leading transfer automation manufacturer in the world, committed to the highest in quality, performance and service at a competitive cost. Linear, part of The Flodraulic Group of companies, is the world’s leading supplier of specialized press transfer automation solutions. Their proven technology is designed to be the most reliable, robust and flexible automation in the market. The equipment is backed by world class 24/7 support from many global locations. Established in 1994, Linear serves the automotive, appliance, HVAC, outdoor power equipment, renewable energy, and consumer goods industries with sales and service locations in the US, Canada, Mexico, Brazil, China, Thailand and the UK. Linear believes in building each system with the simple goal of never being the bottleneck in the process by utilizing scalable engineering and technology, custom motion profiles, intuitive and efficient operational software. In order to provide world-class service to their international clients, including 5 of the global top 10 automotive OEMs, global appliance and HVAC manufacturers, Linear has established service and support center in all regions where their equipment is installed. Linear ensures that their customers receive the optimum solution for their requirements. Linear achieves this by putting their customers’ needs first and working with their partner suppliers to ensure that each component and device is class leading, globally available and reliable. Their goal is to ensure whatever model or type of automation that is procured from Linear, it is always consistent, reliable and globally supported. Rittal is part of that promise, to work with industry-leading partners, with globally available solutions, globally supported with the highest quality and reliability. “One of the biggest advantages in partnering with Rittal is that they offer a standardized, consistent product that meets ours and our customers’ needs,” says Rama Jayaweera, President, Linear Transfer Automation Inc.
To achieve this, Linear performs an extensive evaluation and qualification check before they standardize on a product and form a partnership with the product manufacturer. When it came to selecting Enclosures, Consoles, Junction boxes, Air conditioning systems to house their critical equipment, Linear performed a market study and after reviewing and working with a number of manufacturers, it was very clear to Linear that Rittal was the only truly global company with consistent and readily available products and solutions. And more importantly – the quality was always at a consistently high level. This paired with the network of local technical associates, led Linear to select Rittal over 18 years ago and have not switched from it being their standard platform. Linear engineers recalled a tough time, when they were asked by a customer to use another supplier’s products; a standard four-week delivery period turned into 14 long weeks, before finally receiving enclosures with back plates that were painted instead of being galvanized, a requirement for their application. To rescue the project, they ingeniously fit Rittal mounting plates on the other supplier’s panels to save the situation. 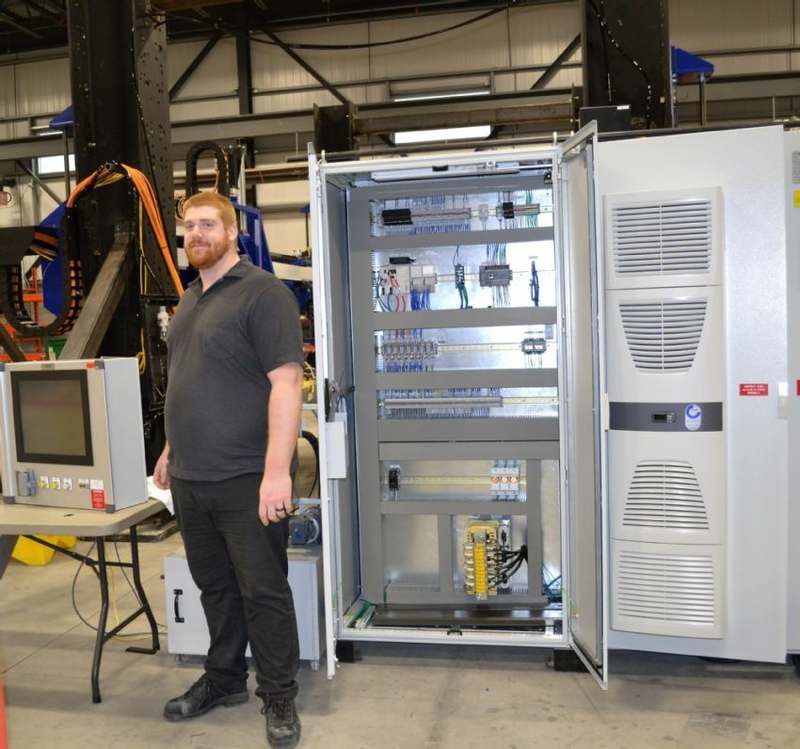 Past experiences also include a time when a supplier provided individual enclosure parts that took their staff several days to assemble, taking them off other critical tasks, and increasing their production build time. Following these and a few other bad experiences, Linear now informs all their customers who ask for other manufacturers’ brands for enclosures, that they will provide Rittal products only. Linear believes that direct cost is not the only deciding factor in enclosures; it is the need for a global, dependable, consistent and quality product – such as provided by – Rittal. Linear used to have a direct account with Rittal when first starting out in 1998. After the 2008 recession, Linear’s new management team aggressively grew the business to become the leading transfer automation supplier in NAFTA region. Due to rapidly expanding volumes, inventory and local support requirements, Rittal introduced them to Proax Technologies Ltd.
With over 55 years’ experience, Proax Technologies is a leading Technical Automation Distributor in Central Canada, that offers innovative product solutions in the areas of Machine Automation, Motion Control and Machine Safety; creating close relationships with their valued customers, vendors and partners. Proax was able to offer top-notch logistical service and economies of scale, resulting in cost-efficient products and services. Now Linear was not only able to receive Rittal’s world-class enclosures, cooling systems, junction boxes and accessories, backed by leading German technology, but also received aggressive pricing levels, inventory and service by working with Proax. Over the past 18 years, Linear has purchased hundreds of Rittal’s flagship TS 8 enclosures and unmatched accessories from plinths to comfort handles, along with hundreds of Rittal’s top of the line Blue e Wall mounted air conditioners to cool the enclosures, providing world leading energy savings. They have also invested in Rittal’s junction boxes, pendant arms and other accessories. Adds Tim Rourke, President, Rittal Systems, “I truly appreciate the collaborative partnership we have developed between our organizations. Rittal is committed to working with Linear to ensure that they achieve their lofty goals and fulfill their commitments to their global clients.” Rittal has pioneered the concept of modular enclosures, which open up a host of benefits. Modular, scalable enclosures can be easily bayed or attached together, saving valuable space on the plant floor and in the assembly line. Moreover, Rittal’s enclosures are flexible and easily accessible from the reverse, with easy wiring capability. The global service network of Rittal is an added bonus especially as Linear has international clients and global locations, so they can easily access Rittal’s parts, service and repair facilities anywhere in the world. Linear highly values Rittal’s Modification centre based in Mississauga, with their state of the art Perforex machine that renders smooth cut-outs with laser precision for a clean-looking panel, and enables them to provide modified enclosures quickly and efficiently. In addition, Rittal has a large warehouse in Mississauga that stocks adequate equipment, so Linear is impressed that enclosures and cooling units arrive within their designated delivery times. The safety factor is also important to avoid accidents on the plant floor, and Linear is aware that Rittal’s flange mount disconnect switch is a large contributor to the safety of their employees and customers. The fact that Linear has access to Rittal’s various software and configuration tools really makes the whole process very smooth and seamless for selecting and procuring. The ability to download CAD drawings for large enclosures through Rittal’s Cadenas tool, or to use the RiCS tool to configure smaller enclosures, is a major advantage for Linear, as it simplifies the design engineering process. Apart from the TS 8 enclosures and Blue e cooling systems, Linear is interested in learning more about Rittal’s other offerings such as their cUL approved Busbar systems, LED lights and the new plinth system that will be introduced soon. Linear is also keen to evaluate the EPlan platform that will digitize and simplify the process from start to finish, and to also test out the Perforex machine that can customize enclosures seamlessly and save valuable time for them. With proven technology and solutions that are designed to be the most reliable, robust and flexible in the market, and a quest for even higher levels of advancement, Linear and Rittal are certainly trailblazing through the automation industry!